University of Arizona Press, 9780816521432, 280pp. It is from the discards of former civilizations that archaeologists have reconstructed most of what we know about the past, and it is through their examination of today’s garbage that William Rathje and Cullen Murphy inform us of our present. Rubbish! is their witty and erudite investigation into all aspects of the phenomenon of garbage. Rathje and Murphy show what the study of garbage tells us about a population’s demographics and buying habits. Along the way, they dispel the common myths about our “garbage crisis”—about fast-food packaging and disposable diapers, about biodegradable garbage and the acceleration of the average family’s garbage output. They also suggest methods for dealing with the garbage that we do have. 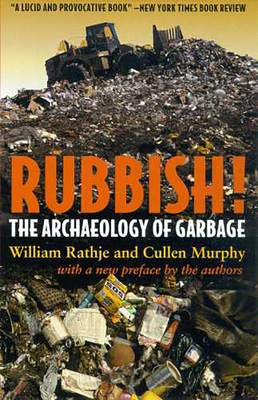 William Rathje is Director of the Garbage Project in the Bureau of Applied Reserach in Anthropology and Professor Emeritus of Anthropology at the University of Arizona. Cullen Murphy is Managing Editor of and a frequent contributor to The Atlantic Monthly. He lives in Boston.